Focus Audio Visual serves a variety of clients, from home to small or large business, and government agencies. 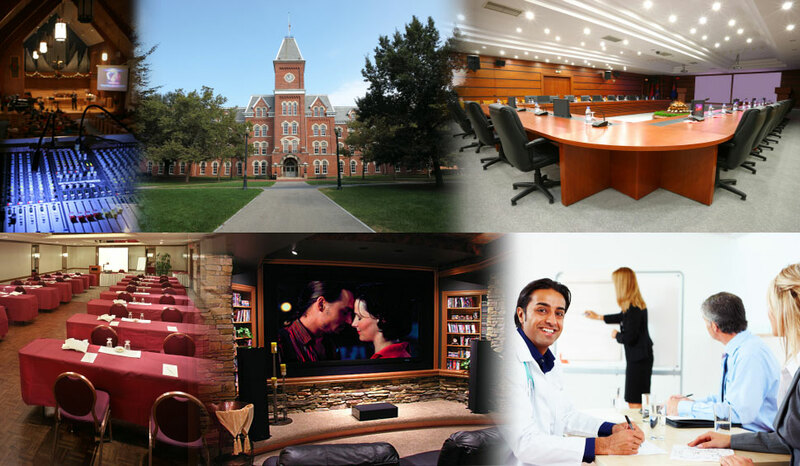 From corporate boardrooms to living rooms and healthcare to hotels, this experience and expanding knowledge base allows us to properly suggest the "right" audio visual solution based on budget, rental or purchase, and your unique situational needs. We're premier audio visual dealers and support all of the major audio visual brands to be incorporated on your project. Interactive whiteboards, projectors, projection screens, flat panel displays, furniture interface devices, players, recorders, document cameras, AV furniture - literally thousands of AV products are at our disposal. In addition to AV equipment, we'll provide the array of services necessary from audio visual consulting, design, integration, installation, training and preventative maintenance that can be contracted for individually or as part of a total turnkey solution - always custom tailored to your requirements. The audio visual aspect of the corporate meeting industry continues to rapidly evolve. Anything that can save time, money, and reduce energy usage quickly becomes mainstream. Many of the new trends meet these criteria as well as offer a new and progressive way of doing things. Focus Audio Visual is always "plugged-in" into the very latest audio visual trends in boardrooms and meeting space to always keep you on the AV cutting edge. It's of the highest importance to us to offer the best in planning and vision, making your investment long lasting and worthwhile. For example, high definition has become an important consideration when people are looking at designing a new audio visual system, and with HD content availability is growing, companies and organizations are increasingly purchasing HD systems with their AV investment dollars. Also, facilities with multiple training rooms and meeting rooms have embraced AV systems that can be networked. Why? There are efficiencies of networked audio visual equipment include remote system access, maintenance program management, energy savings and even automated e-mail alerts if the equipment is disconnected from the system. For the home theater, focused space and layout planning for possibly glasses-free 3D TV, remote controls, advanced projectors, speakers, and cable and wiring placement could make your investment more fruitful. Let us assist you to make your audio visual project the best that it can be for now and into the future.